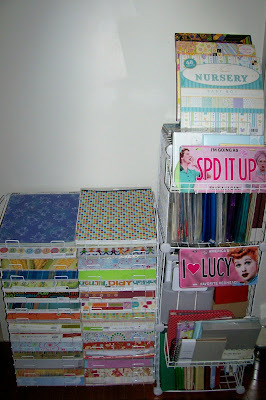 Confessions of a 20-something Scrapbooking Mother: My scrap room-LOTS of pics! I've been working so hard trying to get my room organized. At least enough so that I can actually craft in it. 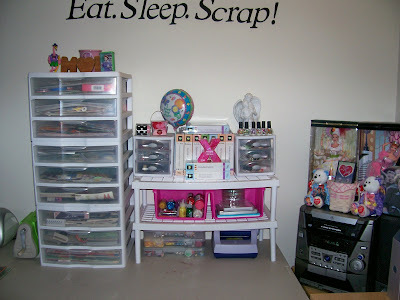 ;) So here is my "Scrap Room on a Budget"! As you can see, this room is VERY small. So trying to fit everything in here AND having room to work has been a challenge! I would love to go to Ikea and buy all of their beautiful storage, or invest in some Jetmax cubes, but I'd rather by groceries! So I improvised! My mom didn't need such a large desk anymore, so she gave it to me! My brother and stepdad put it up for me this weekend and I LOVE it. On the desk I keep all of my cardstock and scraps. The Cropper Hopper paper holders were given to me from my friend Jill for Christmas a few years ago. The container I keep my scraps in was a few dollars at Wal Mart. 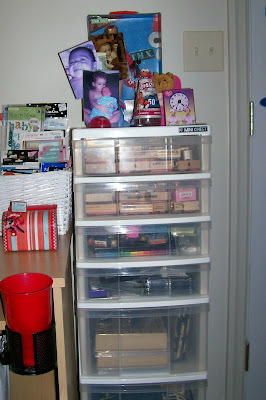 I also have a pink container that holds my flowers (sorted by color), my Stickles and my bling. In the corner I have a lazy susan that I got at a yard sale for $1. I keep my pens, markers, and pencils in 3 metal buckets that I got in the Target dollar bins on clearance for 25 cents each! Someday I'll alter them... I also keep my adhesives and a few tools that I use often in a little bucket. The other side of my desk is my work station. Over here I keep my idea book, paper trimmer, and a basket of boy embellishments so they're always handy!! I bought this 7 drawer container for 50 cents at a yard sale. 50 CENTS! I keep my stamps, ink pads, punches, mini albums, and tools in here. The small table my stereo is on came from freecycle. And I keep some of my I Love Lucy stuff on top! :) I've had the white table for almost 10 years now. I bought it when I was a junior in high school and first started scrapping. When I got my first job (as a pharmacy tech) I took my first paycheck and went to Lowes to get this table. I still lived with my grandparents then, and I had the whole basement to myself, so I was able to set up a nice little craft area there. Anyway, moving on! I used to use the white shelves in my closet for my shoes, but now that I'm a mom I don't have as many shoes as I used to, so I don't need shelves anymore! 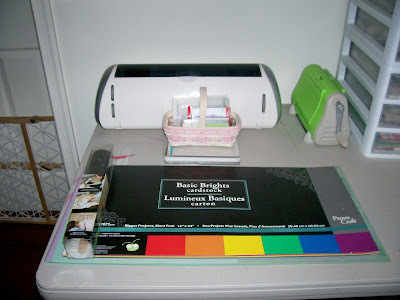 I keep my Cricut carts, Xyrons, chalks, glitters, and all of my small embellishments here. In the drawers are seasons, holidays, alphabets, animals, sports, and school. I bought these years ago at WM. I keep stickers, embellishments, and some papers in here. These organizers came in a tool box from WM for about $5. They are great for traveling because the lids are super tight so nothing gets mixed up! I have everything mainly sorted by color, but I also have some sorted by theme. As I said, my room is teeny tiny, so I have to keep things under the table too. Jamie said he was going to hang my ribbon holder on the wall. So maybe that will happen. Someday. ;) I bought this shelf at a yard sale for $3. It is supposed to hold books or movies. But it works great for my ribbon! I keep my paints and photo case under here too. I also have a rolling organizer with a drawer for Christmas items, baby/kid/family items and a drawer for non-paper crafting items! Over here is my paper. I LOVE paper. I got the paper rack when the LSS I used to work at closed. 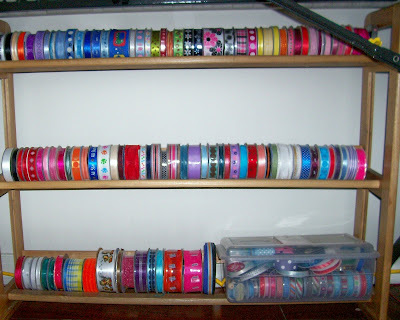 :( I have it sorted mainly by brand, but the top 4 shelves hold boy and family papers! On the wire stand I have my albums, things to alter, and kits. On top are my paper stacks. So that's my room! I still have a few things to do. Pictures to hang and I'd like to get a pegboard for the wall too. I LOVE my room though. I'm so happy. I told Jamie I want to sleep in there! :) Aaron got to play in the snow tonight-first time this winter-so I'm going to print the pictures off that I took and go scrap tonight. I hope you have a wonderful night, and thanks so much for stopping by!! Becky! Your room is WONDERFUL, and it doesn't seem small at all! I have a small area, so this room looks big to me! 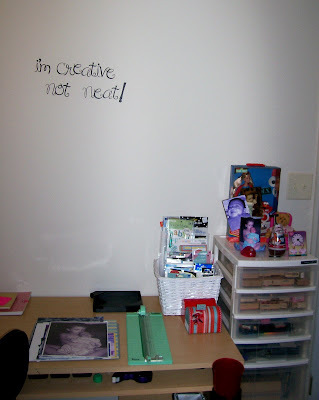 What I really like about it is that you have a TON of wall space! Your organization can go to the walls next if you need it to!! Wow! I have gotten TONS of stuff at garage sales too! I love finding organization items for $1 or $2!! It makes me happy! Your room is GREAT, and you must be thrilled and very inspired when you're in there!! P.S. You know the first thing I saw when I looked at the first pic? The Elmo eyes!! We LOVE Elmo in this house! 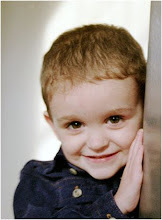 He's been our favorite for over 12 years now since my oldest was a baby!! 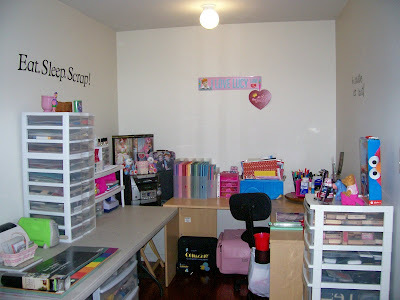 I love your space, it is so organized and neat! 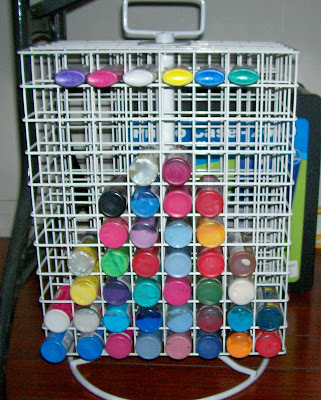 I love your paint holder and eventually I want some paper racks like that! Right now it would not work in my house with little girls hands!!! What a great space. 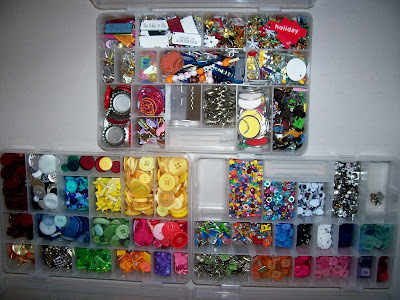 You've done well with organizing and it is so neat! Thanks for sharing! I'm jealous with a capital J! Your scrap room is just so yummy! My adorable daughter said, "oh she is so organized. better than our room!" DH, "kids can only tell the truth!"